Melbourne Food and Wine Festival (MFWF) is the one and only season of the year that I’m constantly eating out, more than usual (:P). To be honest, this weekend, the Boy and I are having a little case of “withdrawal symptoms” from dining out at a restaurant or attending an event. We kind of looked at each other this weekend and said, “Hmm… this feels weird. I feel like we need to be somewhere eating out or listening to some chef speak or cook”. So to cure this bad case of MFWF withdrawal symptom, I thought I would re-live it with you, my dear readers. MFWF is great for Express Lunches, and indeed I only managed to fit in 5 express lunches this year, amongst all the other extravagant belly stretching dining experiences. To start you off with my Express Lunch adventures, I shall bring you along with me to the 35th floor of the Sofitel Hotel. 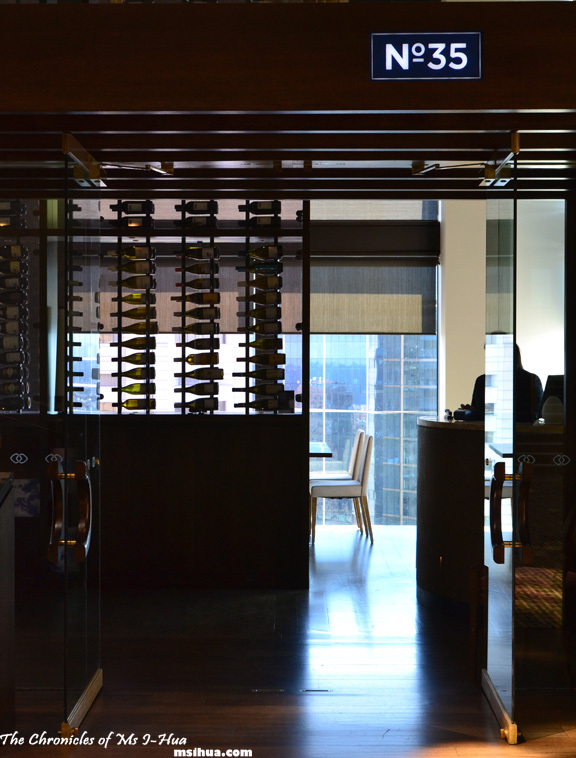 With breathtaking views and quality food, don’t blink or you’ll miss it all. The usual gang (Azzie, Tazzie, Mazzie) minus Kazzie and Razzie took a really long time to come to a decision about where we would go to dine for our gang’s Express Lunch adventure. Tired from their bickering (and mine) about places to go, I decided to take the lead and decide for everyone. 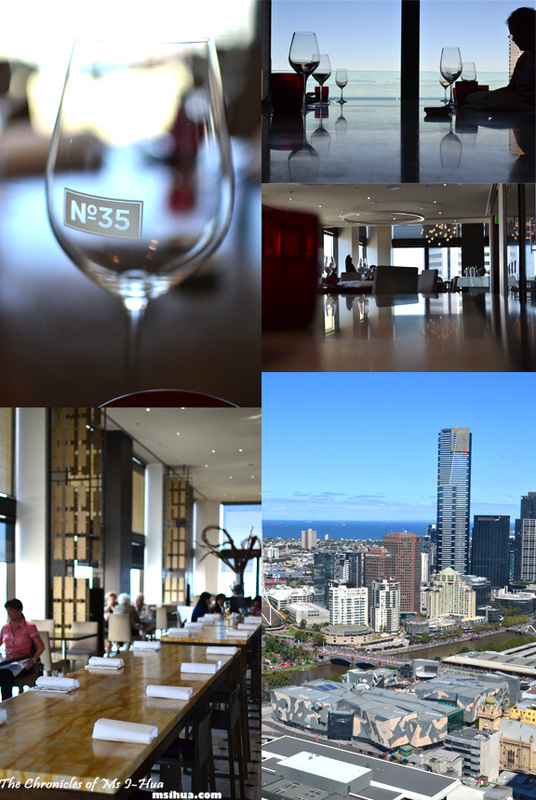 The Boy and I have always wanted to dine at No 35, due to its previous “hatted” status but also because of its breathtaking views overlooking Melbourne’s prettier side (of the Yarra River, Botanical Gardens and Art Centre). All 7 of us arrived at 12pm sharp to the amazement of the staff. We were then brought to an extremely large marble table, where we immediately fell to fit of giggles and high society impersonations. Service was friendly, but slowed towards the end, as the restaurant’s capacity started to fill out. But apart from that small factor, we had a truly enjoyable time. With the MFWF Express Lunches, you get a 2 course meal, a glass of wine and tea/coffee for $35. For a small fee (usually $15), diners are allowed to choose an additional course to their meal. More often than not, I find myself going the 3 course option, just so I can have a little taste of everything on the menu, and also, that’s how we like to roll! 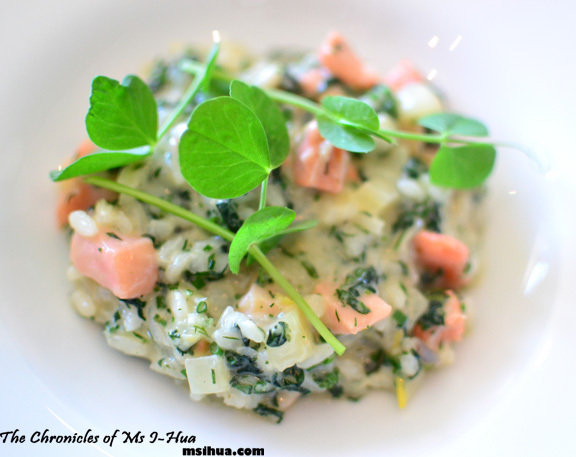 Entree (Option 1): Cured Salmon Risotto, Horseradish, Nettles, Creme Fraiche. For my first course at No 35, I had the very delicious risotto which was light and fluffy (not too gluggy) with the salmon providing a nice bite to it. 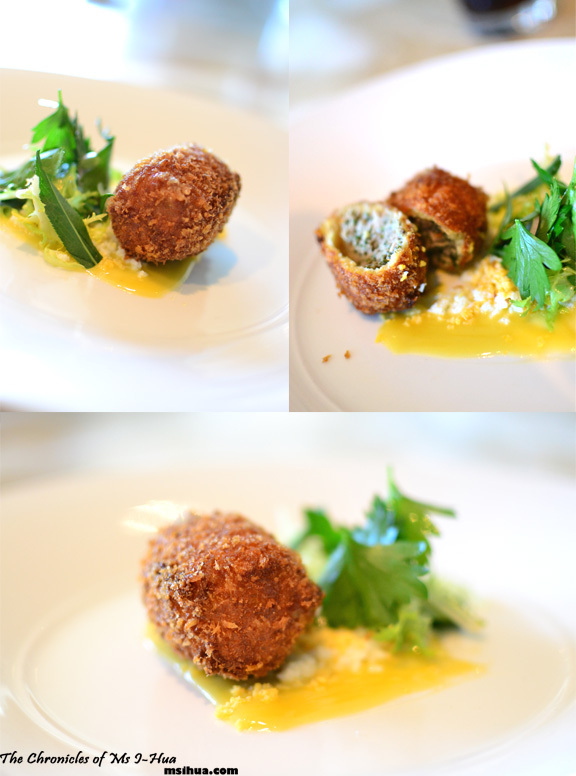 Entree (Option 2): Pork Croquette, Ravigote, Eggs, Frisee. The Boy had this very crispy croquette that was delightfully jam-packed with flavour despite its rather lacklustre appearance. The ravigote sauce and the tiny bits of egg provided a nice complement to the croquette. 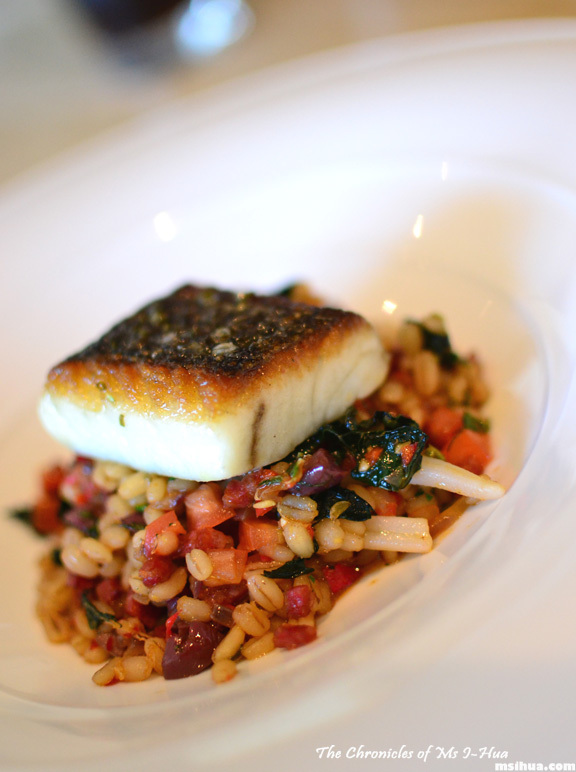 Main (Option 1): Mulloway, Barley, Chorizo, Calamari. The fish of the day proved to be mulloway, which paired quite well to the rather hearty mix of barley, chorizo and calamari. There was a spicy kick to this dish which sort of went well with the crispy and succulent mulloway. Main (Option 2): Lamb Shoulder, Eggplant, Aged Balsamic. Whenever I see lamb on the menu, I usually almost have to have it. It’s my one weakness! The lamb shoulder at No 35 didn’t let me down. The shoulder was tender and the crispy bits of crackling (I think) provided a nice crunchy texture, along with the acidity and sweetness from the combination of apricot and balsamic. There was a piece of charred lamb fat that was a heavenly melt-in-the-mouth goodness that had me groaning in delight (and I wasn’t the only one at the table doing that!). 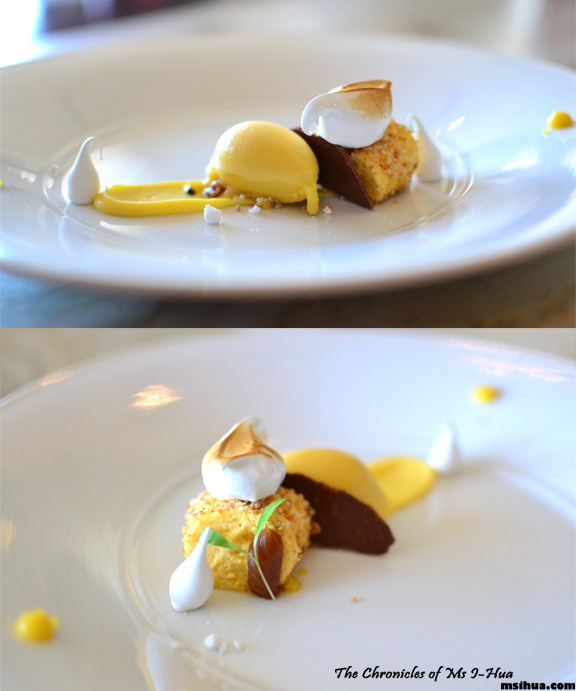 Dessert (Option 1): Passionfruit Bavarois, Salted Caramel, Passionfruit Sorbet. When it came to desserts, the Boy and I both wanted to try the coconut dessert as neither of us were much fans of passionfruit. Tazzie kindly offered his dish up for us to take a quick snap of. 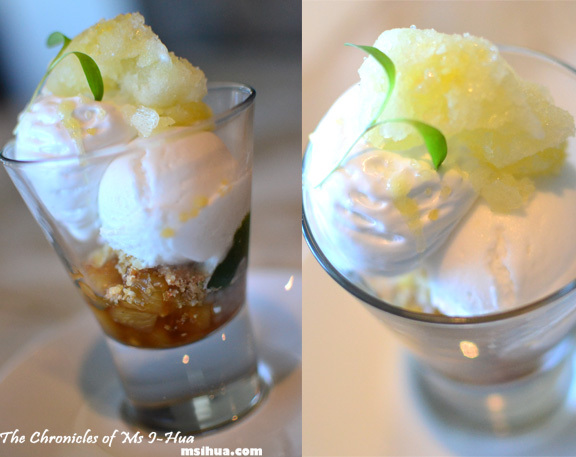 Dessert (Option 2): Coconut, Pickled Pineapple, Lime Tapioca, Granita. I really liked the dessert which we opted for. A nice end to a heavy main dish. The lime was definitely sour and tangy enough to cleanse our palate, and the mixture of coconut, pineapple and sago brought a welcome sweetness to the tartness of the dessert. I should’ve had two serves of this dessert! I’m quite keen to see how No 35’s new menu turns out in their upcoming revamp. I would be happy with coming back here to dine anytime based on their current menu. My only advice is to leave yourself plenty of time when dining at No 35 as getting anyone’s attention for service takes a while. Please note: The Melbourne Food & Wine Festival Express Lunch (Choice of 2 courses, a glass of Victorian wine, and tea/coffee for $35 per person) has ended for 2012 and will return in 2013. Oh you hard-done-by fancypants high-lifers! 😛 Teehee. If only I had events to go to all the time! 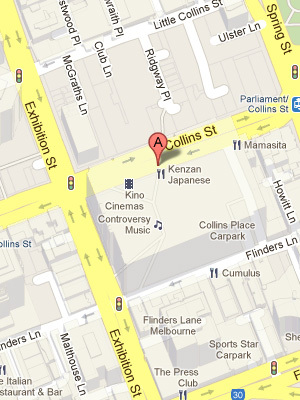 Instead, I have… Coles across the road. Lame. That risotto looks so goooooood! ell, that is the life of a student! Enjoy it! The menu will change by the time you get back! All the dishes are just artwork! So pretty! 😀 Hopefully they’re on the express lunch lineup next year too! 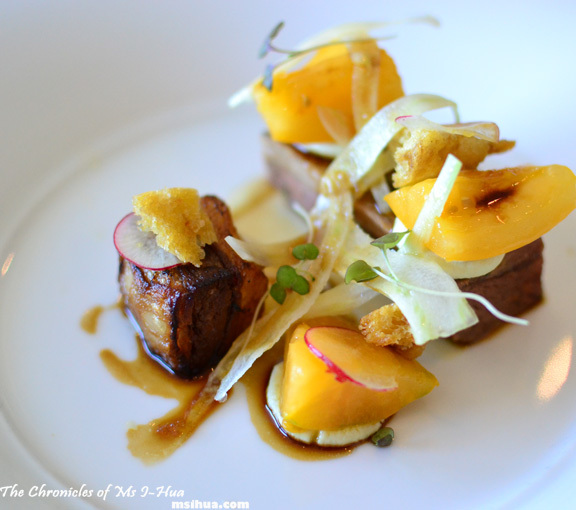 I love it MFWF withdrawal symptoms – I am totally suffering from the same thing! I feel absolutely lost Cara! LOST! Can’t believe you guys ate after eating like crazy the night before! Though, I can’t say I’m shocked LOL Love the look of that Passionfruit Bavarois. All the food look so beautiful. I do hope I get to make it to some express lunches next year! It was very pretty indeed! 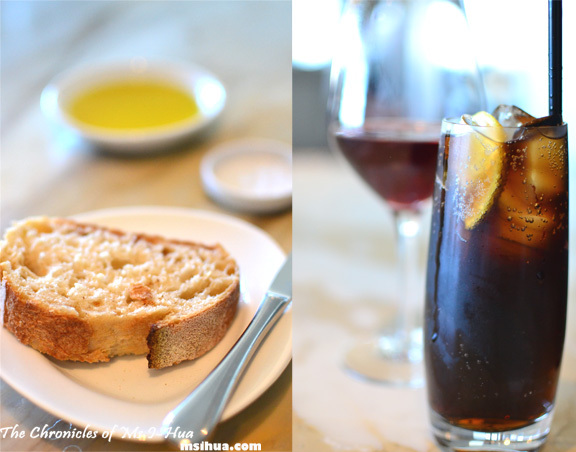 Popcorn & Toast recently posted…Vue Dynasty. 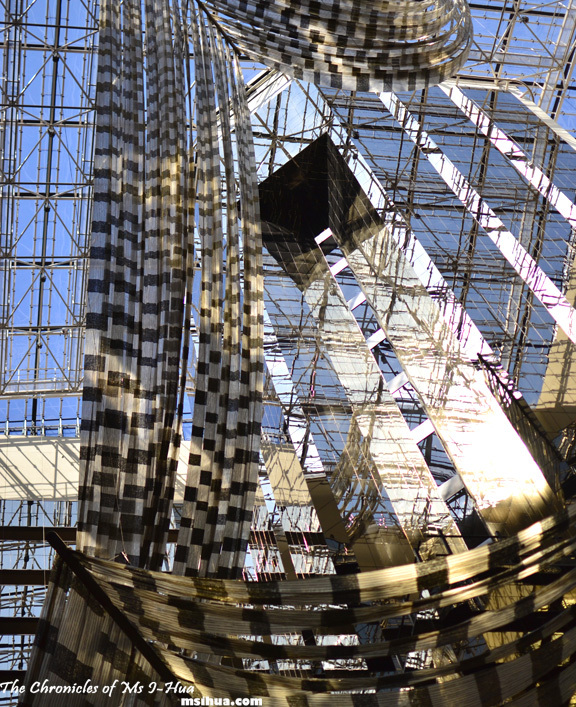 I love No 35 – great views and good food, time for a visit! It does have amazing views! Thank gawd you made a decision on No35. We might not have gotten anywhere without you and Gaz! I know! *bow to me*! Love being able to see what food I missed out on! A lot of places seem to be doing lamb shoulder as one of the courses. Lucky I’m not as adverse to lamb as I previously was! It is.. not only the express lunches.. it’s quite common now!